Undeniably, 30 years in any profession is commendable and this is just what Andy Baxter, founder and owner of Coach Multimedia Systems (CMS) has achieved. He has spent three decades in the business of supplying and installing audio, visual and security systems on PCVs. However, it was in 2008 that he struck out on his own and founded CMS. Chris Peat took the opportunity to speak to Andy to get an insight into the business and to see what the latest developments with his company are. Coinciding with Andy’s 30 years in the industry is the new CMS website (www.coachmultimediasystems.co.uk). The online portal not only gives viewers contact details for the company, it provides images and details of the products offered and some information on the business itself. Andy said it took a while to get off the ground, but ‘it all looks good’ and was worth the wait. CMS is based in Shipley, near Bradford, West Yorkshire, which Andy says means he is ‘pretty central in the country’, aiding him in the provision of a fully mobile fitting service. He supplies the main brands when it comes to audio, visual and entertainment systems, as well as other electrical equipment for installation onboard. His firm is a UK dealer for Actia audio and visual equipment. The brand is supplied to dealers, such as Plaxton, with any warranty issues taken care of by Andy. He has been doing this since beginning CMS, having had a few dealings with them before. In 2010, CMS was appointed the UK Distributor for Dension passenger infotainment devices. The brand is relatively new to the bus and coach market, according to Andy, but is ‘huge’ in the audio visual aftermarket for cars. 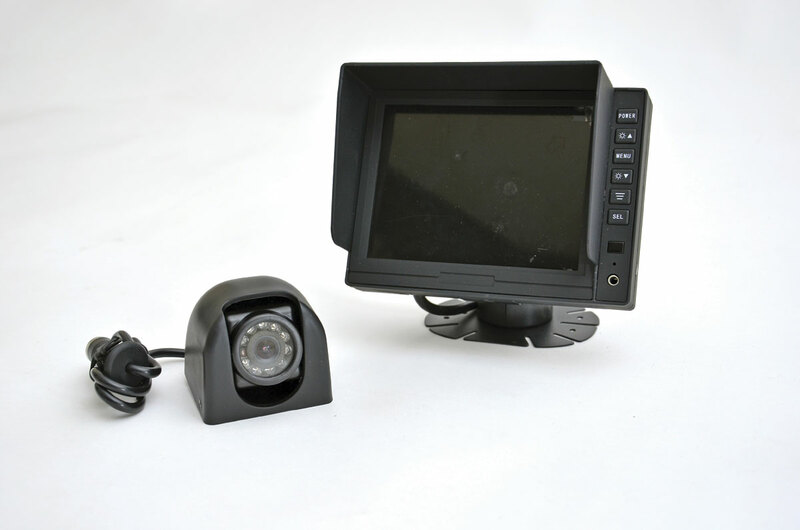 The company provides a system featuring a control unit at the front of the vehicle, with a screen on every individual seat, similar to aeroplane entertainment systems. The individual screens can be used for each passenger to view or listen to TV, DVDs or radio, but they can also upload their own movies or music from personal devices via USB or SD card. Andy travelled to Hungary to meet the company and view the system before heading onto Poland to the Kapena factory to install a system in a Mercedes mini coach which was destined for the Kortrijk show. Andy told me that he can source the majority of electrical items, including monitors and PA systems from manufacturers like Blaupunkt/Bosh, JVC and Pioneer. 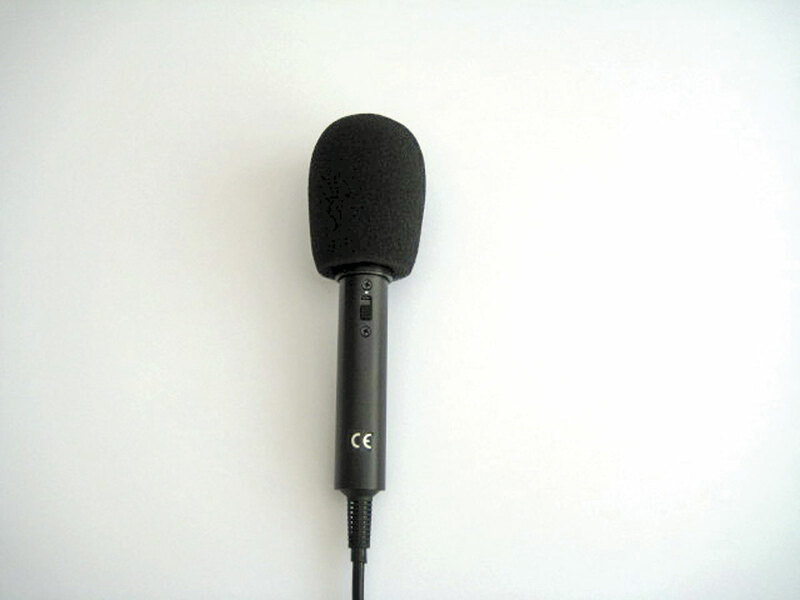 The company also has its own branded range of equipment he imports. At the moment, his best selling products are LED monitors. 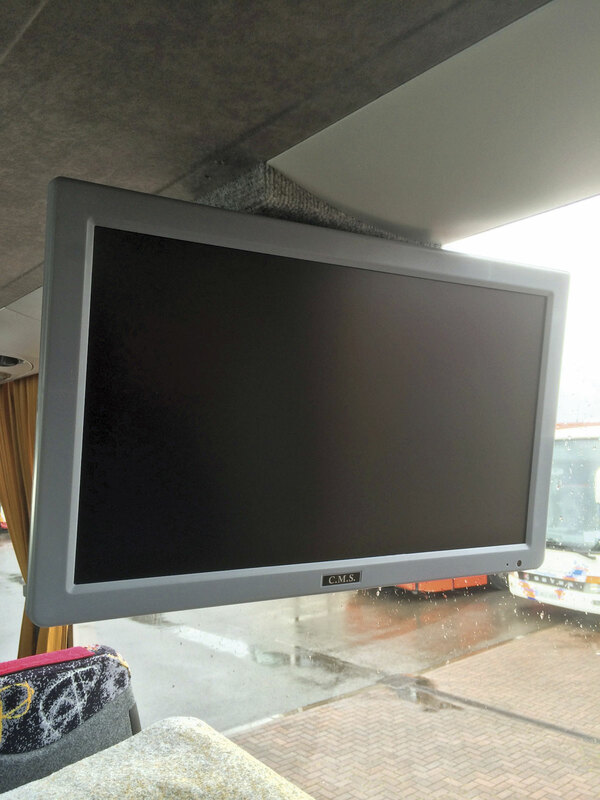 These are proving ‘really popular’, not just for new vehicles, but to replace older screens on coaches too. He can also install wi-fi, an increasingly popular feature. As well as working with operators, CMS also lends its services to dealers. Although most of the vehicle’s audio/visual equipment will be installed during the build phase, Andy said some customers often specify extra equipment, such as another monitor, a sat-nav or reverse camera, once a new vehicle is delivered. It is on these occasions that the company is often called in to assist dealers. Over the years, Andy has worked with operators up and down the country, throughout the north and south and in Ireland. He even supplied equipment to a coach operator in Malta, fitting a microphone and reversing camera. Most of his work comes from operators, but the amount he gets from dealers is not negligible. He has gained contacts with dealers and operators from his extensive time in the industry, which helped a great deal when setting up his own concern. They knew from past experiences he would do a good job. Andy’s time in the industry started in 1984, when he attended Leeds College of Technology and passed his City & Guilds auto electrician course. He then gained valuable experience travelling all over the country to the likes of Moseleys, Yeates Bus & Coach, Plaxton and Kirkby Bus & Coach to name a few, installing audio/visual systems comprising of radio cassettes, PA amplifiers, driver microphones, courier microphones, speakers and aerials. Most of these items were not standard on new vehicles back then. In those days, the visual side of an installation comprised of a 12v/24v converted TV mounted into a metal or wooden box which was carpeted in the same material as the coach. Sometimes this involved the vehicle having to have metal work installed to take the weight of the box. This would be connected to a video player which again was mounted in a metal lockable box secured on the luggage racks, going from a single TV installed to eight to ten TVs installed into double deckers. This soon became popular and certain manufacturers began to develop equipment specifically for the bus and coach industry, operating on 24v or 12v. Andy said purpose built monitors with mounting brackets made the installations easier and more professional looking. CMS today provide the industry with the same level of service but with all the latest multimedia equipment. Standard radio/cassettes have now been replaced with digital radio and DVD/HDD players while LCD/LED fixed and motorised monitors replace the old heavy CRT units. The introduction of CCTV and wi-fi in today’s market has seen the company spread its portfolio even further. 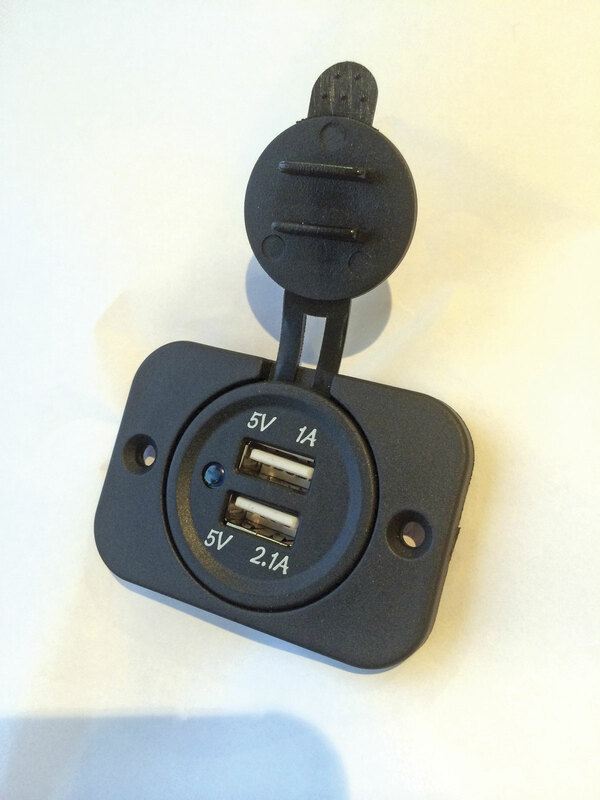 The latest additions to CMS’s multimedia range are USB charging systems. These are something Andy has been developing since late last year. With the ever increasing number of smart phones and electronic devices in use today and the need for people to be connected 24/7 these chargers give each passenger the ability to keep their devices charged while on the vehicle. These days, there is a lot more room and space for mounting and working on electrical systems in buses and coaches, he says. Modern vehicles are designed with the installation of this equipment in mind. Things have certainly come a long way since the past, when it was a case of converting and fitting home TVs to coaches. When Andy started CMS in 2008, business was ‘really good’ and has continued to grow each year, though the recession did have an impact. However last year ‘was a good year ‘ and this year has started ‘better than ever’. He remarks that dealers are all ‘up beat’ and believes people will always want this type of equipment fitted to their vehicles.